Ok, I just moved back to California. I will explain all the details later. For now, enjoy this video of me being interviewed briefly, and me interviewing Cashis, a very well-known rapper from Shady Records/Interscope. See if you can spot my stuttering…it won’t be hard. Another good segment on stuttering! If anyone has not seen this yet…WATCH IT NOW. This is a good 5-6 minute on ABC about stuttering featuring Dr. Phil Schneider and one of his past students, Michael. This is one of those segments of stuttering that does not focus on the miracle cures but a different way of approaching it. ABC won’t let me embed it for some reason but here is the clip. Enjoy! I got back to my part-time job at the end of March. To refresh a little bit, I deliver pizza and I had been taking a hiatus because I had heel surgery in mid-January, and I was taking time off to kind of gather my current status after my mom passed away. Since I have been back I have been working a lot again. My car smells like pizza again and I am back driving on poorly maintained roads. Whoopeee! It is a good job though, especially for my speech. If only I had a camera crew to follow me around and show how much I stutter haha. On occasion I do slip in some management techniques into my conversations with customers. A lot of the time, my secondaries just come out in a flash. You know what though? It feels great! Not only am I showing people that I do not care about my stuttering (in a good way I mean, not a careless way), but I am also making them wonder about it. For people to understand what stutterers go through, they (people) have to being wondering about. Now, yes I do have people who smirk, laugh, be rude, feel awkward, and etc around me when I stutter but that rarely happens and when it does, I react non-emotionally. Personally, it is surreal that I have conditioned myself to react like that because when I was younger I was always very sensitive to peoples reactions about my stuttering. I even had situations where I had to call up customers. Honestly, that is kind of scary at times because you are calling a stranger who might think you are faking, prank calling, etc. But then I think to myself “oh well.” Whatever happens, happens :). Surprisingly all the calls I have mad at work, I have only been hung up once and that was on the first try. So if you are at work and have nervous speech situation, just go for it. I don’t know who says this quote, but if you want something you never had, you must do something you never have. If you want people to understand, you have to reach out first and show them you are ok about your stuttering! Just a moment to reintroduce myself. Hey everyone, It has been a while since my last post. I just wanted to reintroduce myself and let everyone know that in the coming months I will be posting more. My name is Alex and I have stuttered since I began to talk. I was added to this blog by Dmitriy, who has been a close friend of mine for a few years now. I am looking forward to sharing more of my stuttering experiences in the coming while. For our blog readers, this Summer Semester I am taking a public speaking class which is required for college in Florida. Has anyone taken or will be taking a speech class? If so, what helped you get thorough it with the least amount of nerves, etc? Looking forward to hearing responses from everyone. Alex. – 2 weeks after my mom passed away, I had bone heel surgery for my right surgery because of a bone cyst. Turns out it was a benign tumor. Yikes! Scary stuff. I was on crutches for a month, going to school on them, which was my first time! They give you a good work out that’s for sure. – I have been taking time off from my part-time job delivering pizza. BUT! My freelance graphics business has been booming so that has been keeping me busy. I mainly make myspace layouts but will be expanding into websites. – After my mom passed away I decided that it is best to move back to San Diego with my dad. My sister, cousins, and my close friends live there and the only reason my mom, dad, and I moved to Texas was because of my mom’s job. We moved to a great town that is growing rapidly. Living here is great, but it just does not feel right that my mom won’t see it grow. – My stuttering has not been so much present in the last 2-3 months. Of course I still stutter up a storm! But it just has not been my worry at all. What has been a worry is life! I recently did some interviews with future SLP grad students, and it felt great to tell them about my experiences and they came away with a lot more knowledge than they would get in class. My new semester began at college in January. All classes know I stutter, and speak up at least a couple times a week in different classes (I’ll be speaking more about that in future posts! ;)). I am off to San Diego for spring break, so I will try to get back to posting more after I come back! Have a great spring break everyone! Sorry it has been a while since the last time I posted. Things have been busy and all lately so I havent gotten a chance to come on and post as much as I would have liked. Dmitiry, as you very well know your Family is in my prayers and I wish you all the best. I will be posting as new events come up. I hope everyone had a wonderful 2007 and an even better 2008! Happy New Year! On January 26th, 2007, my mother passed away. She had been struggling with cancer for the last four years and last night she finally found peace. She was an amazing, beautiful, brave, kind, [and so much more!] woman. She has influenced my life so much that I come as a reflection of her. She will be greatly missed by family and friends. For me, she was one of the most important people in my life. I could always talk to her about anything and look to her for guidance. I know that she is physically gone, but she will always live on inside me and around me. Right now, I am in a surreal state and will probably be for a while. It will feel weird coming home from school and not seeing her or hearing her call my name, or calling her daily when I am traveling somewhere. She achieved the American dream in only a few years after my family and I moved to America from Ukraine. I seek to do the same, achieve the American dream that many achieve to admire. That is why I am going to be taking a break from writing posts on this blog. Also, I am comfortable with my stuttering at this point that there are no “crazy” stories going on. I am hoping that the other half of this blog, Alex, will write some posts about his stuttering and what’s going on. 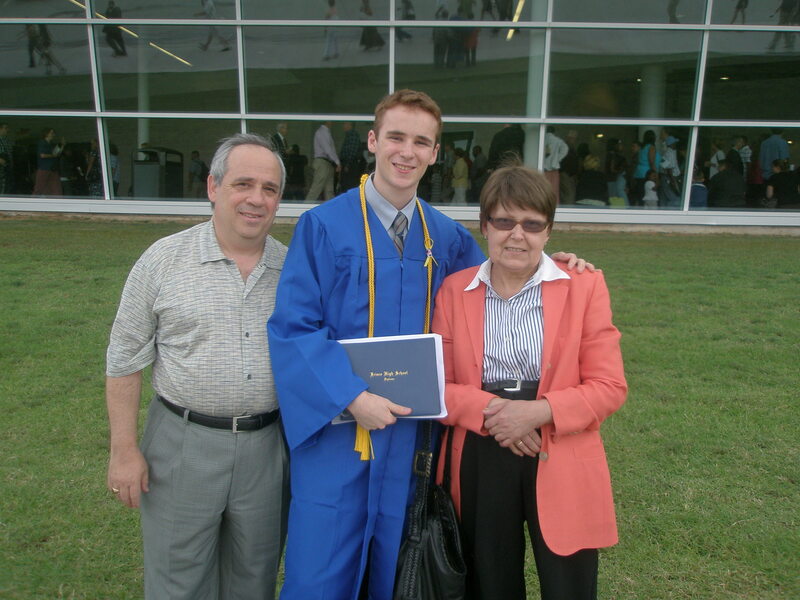 My parents and me at graduation. May 28th 2007. I am a daily reader of the site Zen Habits. There are always good articles about how to “modify” your life. Such as not procrastinating, overcoming bad days, being positive, etc. Those kinds of articles. I recommend that everyone, especially stutterers, read one of the latest blog posts by the author of the site, Leo Babauta, titled: 25 Killer Actions to Boost Your Self-Confidence. I know for a fact, that everyone struggles with self-confidence in their life, not only us stutterers. <— That statement can be quite refreshing to hear because way too often stutterers think or assume “we are the only ones who feel like this or like that.” You catch my drift? I used to think I was the only stutter in the world (no joke!). We all must remember of the positives and keep reinforcing them. So when you are in a new environment or situation, and afraid/shy to let out your stuttering, then “JUST DO IT!” You never know how it can turn out compared to how you imagine it will turn out! Anyone got similar stories to share? On one of my deliveries last night, I would say it was around ten pm. I made a delivery to a couple of kid a little younger than me. They were playing pool in their garage; As I went up to them, one of the kids asked me for the price and I began to stutter, as well do my head jerking. A couple of kids smiled and immediately turned around and began laughing. The kid who I was telling the price to kept saying the wrong price on purpose, with a smile on his face. “$7.86?” “$10.86?” The price was $17.86. He gave me the tip and I walked away with no sweat on my face, no redness, no queasy stomach. Just a smile. Overall, the point is. If I would said something back, it would have been more awkward than it already was. For them of course. I was feeling fine the whole time and I am beginning to react less and less to how people react to my stuttering. It is a good feeling to have, but it has taken me over two years to come to this point. Dealing with rude people at work, reacting the wrong way, and dealing with life in general has provided me bits of pieces to further “bulletproof” myself against rude people, clueless people, etc. I have nothing against them as I did before. Honestly, and you’ll think I am weird for this, but I enjoy dealing with situations like the one I just talked about. It widens my perspective and my understanding of all types of people.